(Nanowerk News) In its bulk state, magnesium oxide (MgO) is a chalky white, rather unreactive mineral that is best known as an ingredient in antacid medication. But when this compound is formed into nanoscale films, only a few atoms deep, things begin to change. While bulk MgO is an insulator, ultrathin MgO can transfer small amounts of charge to substances, such as metal catalysts, adsorbed on its surface—giving these films the ability to tune chemical reactivity and unlock new reaction routes. Now, researchers led by Yousoo Kim and Maki Kawai at the RIKEN Advanced Science Institute in Wako have used MgO films to establish unprecedented control over bond-breaking pathways at the single molecule level. The team reports that water molecules adsorbed onto ultrathin MgO can be selectively split apart using the sharp tip of a scanning tunneling microscope (STM) ("State-selective dissociation of a single water molecule on an ultrathin MgO film") . Figure 1: STM images record the transformation of an individual water molecule on ultrathin MgO (center of left panel) into a hydroxyl group (center of right panel) through vibration-enhanced resonance (scale, 1 nanometer). According to lead author Hyung-Joon Shin, understanding the activity of MgO films required a detailed study with a well-known compound. "The atomic-scale picture of a single water molecule on the MgO surface has been [in] demand for a long time," says Shin. "And, we expected to see interesting dynamics from the water molecules." In their STM experiment, the researchers worked at temperatures close to absolute zero to produce stable images of water molecules adsorbed on ultrathin MgO (Fig. 1). By injecting small amounts of tunneling current with the STM tip, they could make the water molecules 'hop' laterally around the surface—but only at applied voltages corresponding to the vibrational frequencies of hydrogen–oxygen bonds. Excitations beyond these vibrational thresholds caused a chemical reaction: the water molecules dissociated into a new species, which STM images and theoretical analysis revealed was a hydroxyl group. Because the energy required to split water on the MgO film was much lower than the hydrogen–oxygen bond energy, the researchers theorized that ultrathin MgO traps tunneling electrons in the molecule—generating a resonance-enhanced vibration that shakes the molecule apart. 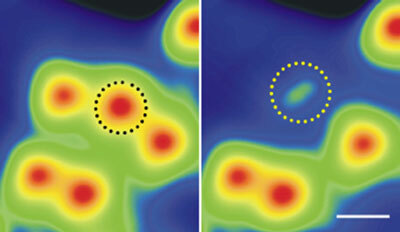 "The vibrationally induced dissociation of single water molecules has never been observed before," says Shin. The team's experiment yielded a third discovery about the MgO surface. By injecting tunneling electrons at voltages close to the hydrogen–oxygen bond energy, STM images showed that another chemical transformation occurred: this time, water molecules split into atomic oxygen. Having two selectable water dissociation pathways—one vibrational, one electronic—has potent implications for 'green' energy research, because water splitting is one of the simplest way to produce clean hydrogen fuel.